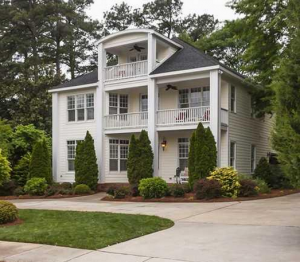 The well maintained homes of the North Hills neighborhood of Raleigh, NC lie along winding, tree-lined streets where those who reside there offer a friendly atmosphere, and a sense of pride in ownership. Homes are built mostly between 1955 and 1970; however the age ranges from young adult, to older active. So the neighborhood is perfect for families as well. As of 2013, there are about 1,800 residents in the area. The homes are mostly three to four bedrooms, have well over 2,000 square feet, and cost in the vicinity of $200K to $900K each, depending on other features and overall size of both the home and the land. There is currently much to offer for sale, meaning you are sure to find something that suits your desires. If you’d like to take a walk through the neighborhood and get a feel for it, the North Hills neighborhood subdivision is located just off the Raleigh belt-line, between North Hills Drive and Six Forks Road. Just nearby the neighborhood is the Capital Area Greenway, which allows for hiking, cycling, and nature trails. The North Hills Club offers a swim and tennis membership to keep your family active and involved with neighbors. They also have other recreational activities. If that’s not your style, the North Hills Park offers tennis courts, playgrounds, trails, and baseball/softball diamonds. If you are a golf enthusiast, there are plenty of courses within short driving distance. The North Hills subdivision is within walking distance of the North Hills Mall, which offers a cinema and plenty of trendy shopping. In addition, with its proximity to the Beltline, those who live here can get to the nightlife in downtown Raleigh and other shopping venues quickly. Some popular shopping centers are Triangle Town Center, and Crabtree Valley Mall. There is nothing better than having options when you live somewhere. North Hills is a midtown area of Raleigh, and a prime area to purchase real estate, as many people make it their vacation destination. There are award-winning restaurants and a four star luxury hotel nearby. There is always something happening, from outdoor concerts to special festivals, and farmer’s market. Not to mention, the area is currently expanding, which will make it much more desirable and add to your home investment. It is said the expansion will add another 45 acres of homes and amenities, as well as office space for budding entrepreneurs. Now is the best time to purchase residence in North Hills. There is always something to do in Raleigh, NC. This is why many are choosing to call the city home. Whether a simple stroll to the local pool, or a drive downtown for some excitement you are sure to have everything you need in this gem of a neighborhood.